Courtney Crumrin desperately needs help to save the innocent faun-like Skarrow from summary execution at the hands of The Coven Of Mystics. That information may rest in the shadows of Radley Hall and the mind of dead demon Tommy Rawhead. But how to get in? Leave it to mystic moggie and actual cat burglar Tobermory  hes getting intruder window. As ray of moonlight passes glass, so shall Tobermory pass. Young Courtney Crumrin will be taking a lot of notes here about how the world works around her: its full of self-interest and hate in the human heart. For those in love, the worst sin is silence, inaction the absolute killer. The good news is that Courtney and silence are far from synonymous, but will she be listened to in time? Love, love, love this series, now in full colour and the covers so far have been in potion purple and library green. Ted Naifehs moonlit Council of Cats is like Kelley Jones equivalent work in SANDMAN: DREAM COUNTRY after an infusion of Mike Mignola and a wide- and shiny-eyed dose of his own design flair for a Crumrin transformed into cat. That which she finds sheltering in fear from two arcane archers is quite magical and long been the stuff of my dreams. Naifeh does soft, sleek and otherworldly to perfection; his monsters are hideously twisted. He is exceptional at making you believe in impossibly large things lurking in improbably small cabinets, like the next one youll foolishly open. 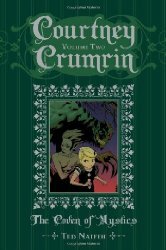 Following COURTNEY CRUMRIN VOL 1, this finds our belligerent young lady in her second year at school and under close supervision from Ms Crisp, a teacher with close ties to Uncle Aloysius but who understands that isolating yourself from the real world comes at a cost. That is a lesson which will be most painfully learned by all. A demon has been summoned which dispatches whole families. A curse has been placed on witch Madam Harker, rendering spoken words into a cascade of frogs. When she tries to write, her hands become wriggling serpents. Someone is silencing all and sundry, while a mute woodland creature called Skarrow seeks sanctuary in Uncle Aloysius once well respected domain. Instead the villagers move in, their metaphorical pitchforks in danger of becoming cold steel. What under earth is going on?! Its time to convene the Coven Of Mystics, the council by whom all will abide. Wrap up warm, my lovelies; Im afraid its about to grow chilly.